The 2019 Chinese New Year “Year of the Pig” begins on the 5th February 2019. The pig occupies the twelfth position among the Chinese zodiac animals. There are also five types of pigs, named after the Chinese elements. In order, they are: Metal, Water, Wood, Fire, and Earth. Pigs are diligent, compassionate, and generous. They have great concentration: once they set a goal, they will devote all their energy to achieving it. Though Pigs rarely seek help from others, they will not refuse to give others a hand. 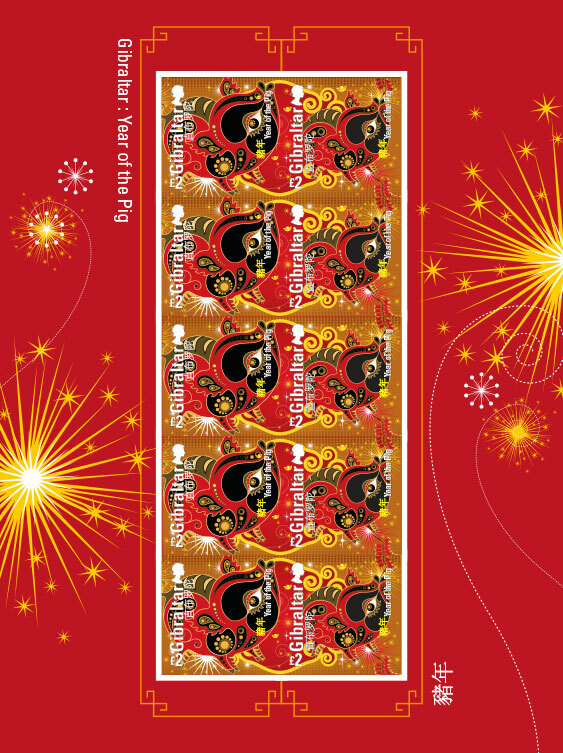 Chinese New Year is the most important of the traditional Chinese holidays and the Year of the Pig stamps are the seventh edition of the successful philatelic series issued by Gibraltar. All Gibraltar zodiac stamps since the first issue released in 2013 have been designed by the same artist in order to keep the same look and feel of the stamps.